SOUND BITES - Note that the sound quality of all samples is heavily reduced, as they are compressed for easier download. 56 Kbps, 22050 Hz, Mono (12.6:1). This outstanding straight-ahead jazz album is as good as it ever gets, quality music lovers!!! So Jay summoned a few of his best musician friends with with long and strong experience in the jazz field and together they made music magic - immortalized on the BEBOP album. 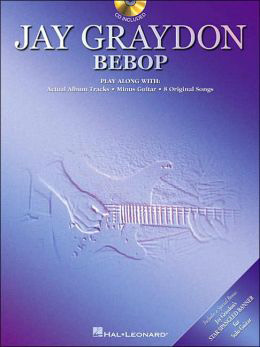 Jay Graydon is an internationally renowned artist with many hits over the years. Among the Grammy nominations is e.g. the prestigious title Producer of the Year and also a Grammy nomination for Best Engineered Recording. The sidemen on BEBOP are not exactly any novices either, or how about Dave Weckl on drums, Dave Carpenter on bass, Bill Cantos on piano and Brandon Fields on sax. Quite a thrilling line up! The musicians on this album have perfect understanding of one another. The versatility of the playing, with harmonic highlights such as Jay Graydon's clean genuine jazz guitar sound, Brandon Fields' warm sax tone, Dave Weckl's swinging drums, Bill Cantos' elaborate piano passages and Dave Carpenter's jazzy bass, makes the album a subtle intelligent masterpiece of quality music, caressing the ears of the listener. The compositions are all new, apart from the national anthem of course. The collaboration of these five skilled musicians, offering each other elbow-room for equilibristic solos, is exceedingly professional and a joy to experience. I am so floored with your musical talent and technical expertise. I can only hope that another jazz CD might find its way to us sometime in the future. As I said many months ago, it is one of the best straight-ahead jazz CDs I've heard in eons. I assure you I've played it many times since receiving it with your presskit. 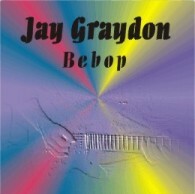 More reviews for the BEBOP album may be read at the review section on Jay's web site. We would like to share with you a few photos taken of some great moments of jazz performed by a stellar bunch of seasoned players at Garden Rake Studios. All photos are taken by Don Q Hannah and Dave Weckl. The cat in the white shirt is Ian Eales who has worked as an engineer on several albums. Ian was nominated for a Grammy Award in 1983 for the "Jarreau" album and was consulted at this gig as studio technician. If you click on these mini pics you will get to the bigger pic and some comments. The BEBOP album is also available as a "Jam-with-the-Band" book/CD package - which is a book with the sheet music and a CD with the music minus guitar as to play with the band, released on Hal Leonard. The other minus one instrument versions are soon to follow. This is a rare opportunity for young jazz music students to perform with a real bebop band. Since Jay could mix the BEBOP album leaving out one instrument, he did a few versions in that fashion. Another fun thing with tunes from BEBOP is presented on the Line 6 web site. They have launched a play-along, online site for guitar players. Three of the BEBOP songs are available on the site! The site has the charts, as well in real time. All written material, all images and photos in all sections of this website copyright © Jay Graydon/KEO 1996 - 2018. All rights reserved. Comments, suggestions, appreciation, corrections...whatever... talk to us.